Value Billing does not have a specific screen or function in Workspace, but can still be accomplished by utilizing the Billing system in a specific way. While value billing traditionally is void of time tracking, there is no reason you can’t track time to validate the amounts you budget for specific services. To value bill in the traditional sense of the term means creating an invoice for an amount that is predetermined for the service that you provide. If you happen to be using the Projects system of OfficeTools WorkSpace, it is a perfect place to plug in the amount decided upon. When on the projects tab there is a field where you can populate the estimated fee for that project. 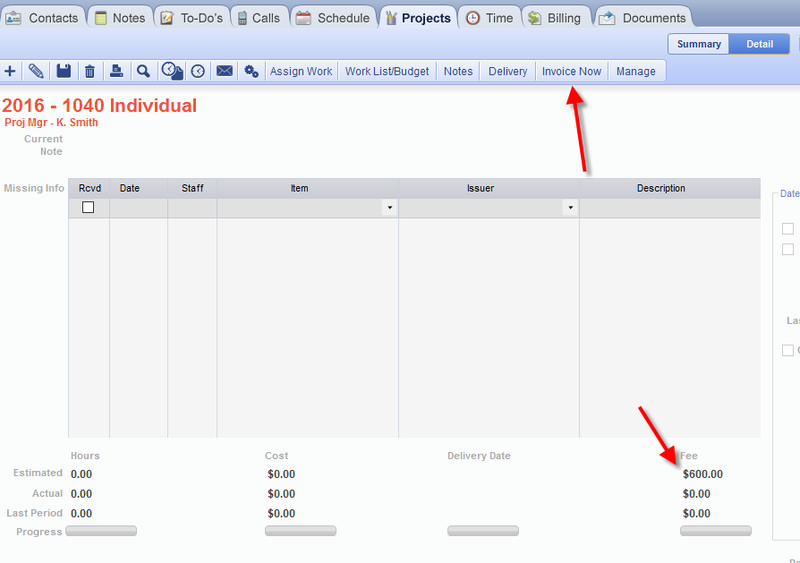 If you populate your value bill amount here, when the project is finished, you very simply hit the invoice now button above in the toolbar to create an invoice for the amount your predefined. If you happen to be tracking time, at that point all time designated to this project will be relieved and adjusted to the total that you had predefined. The resulting invoice will be treated like any other invoice at that point. The “value bill” is created by effectively disregarding the time it took to perform the job and pricing the job at a specific rate. Alternatively, a value bill can also be created by creating an invoice and simply adjusting the invoice total to the value bill amount. For example, if you perform a tax return and priced it at $600.00, when you create the invoice you would write it up or down to $600.00. It really is that simple. Some offices that track time while value invoicing, will create an “In Process” invoice in the beginning of the engagement to keep track of the originally quoted amount, and then at the end of the work, they will apply all the tracked time to that “In Process” invoice. Again, if you are not an office who is worried about tracking time or seeing that represented in reports, then follow the same process without the element of time. Please note once an invoice has been created using any of these methods it will be treated like a normal invoice. There is no “Value Bill” designation that will be seen. What makes a value bill a “value bill” is what the invoice amount represents. The presence of time just simply provides a measuring metric to see how your prices are stacking up to the amount of work that is actually going into the job. Is it necessary to track my time if I strictly do value based billing? Why is my time not billable? 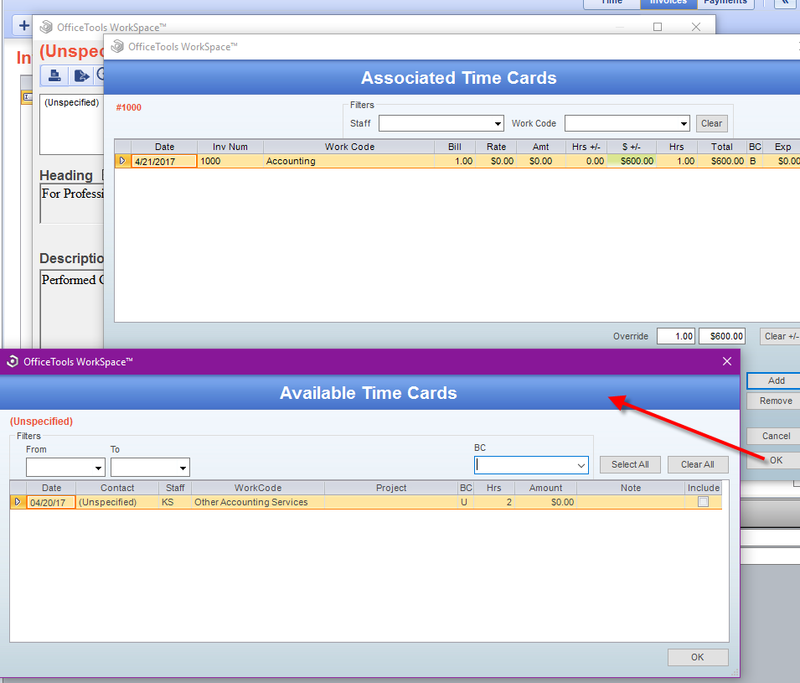 Why is my time not showing in the Billing time screen?